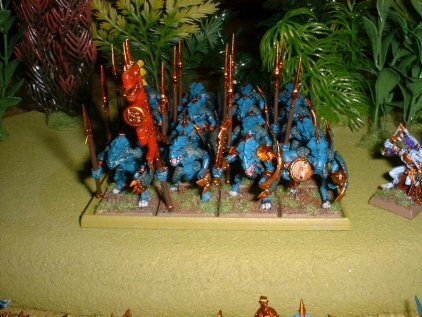 Recently I've begun a Lizardman Army and I'm using the "Tale of Four Gamers" method. For those of you who are unfamiliar with this method it's a system of building up an army over the course of a few months to a limited budget. The name relates to an article that began this idea a few years back in "White Dwarf". The initial instalment in month one is £50. After this I allow myself £30 per month (initially in the article it was £25, but one just HAS to allow for price rises!!!!) for four months. So it's a five month project that should give you a workable force. You can spend up to your budget allowance per month. If you haven't spent all your budget for the month then you can carry it over to the next instalment and add it to the budget for that month. So, why did I choose Lizardmen? There is a Lustria Campaign looming in the summer. I've never collected them before. My brother (Chris on this self same website) doesn't own them!!!!!!!!!!!!! It helped that Saurus are also rock hard. So, what was my outlay this month? £ 3.60 - Skink Priest. Making a grand total of £44.10 spent. This leaves me with £5.60 to add to next months budget. I made these selections for a simple reason. I feel it’s always a logical step to start with core units. This selection gave me four units - 2 units of 16 Saurus and 2 units of 12 Skinks. 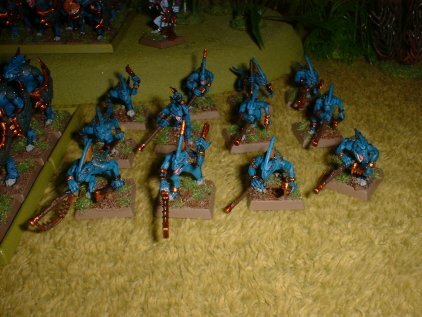 The Skinks are skirmishers so can get away with being small units. The Saurus provide good hard hitting troops with a fairly decent survival rate. The Priest adds a magic user. Battle 1 - Pitched Battle. 1000pts Lizardmen Vs 1000pts of Dark Elves. I placed both my Saurus units on one flank with a unit of Skinks and my Priest. 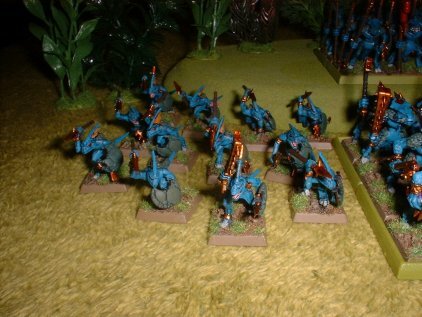 A unit of Skink scouts were placed ahead of the party to spring out on the waiting Dark Elves and annoy them. Dark Riders slowed my advance and pulled it apart and I forgot to use the second shot with my poisonous blow pipe Skinks on some Dark Elf Warriors. A very hard learning curve. I was obliterated. Protect the flanks and don’t get distracted was the lesson. Battle 2 - Scouts & Pickets (Warhammer Skirmish scenario from The General’s Compendium). The game started with a rush of Skinks towards the central clearing containing the Dark Elf Scouts. Poisonous Darts felled a Dark Rider but didn’t take him out of action. In the Dark Elves turn they scattered to the four winds in an attempt to pull my attack apart. One or two Skinks went down. In my turn I charged the fallen Dark Rider but he still managed to cling to life. I took down a Shade who I charged in my next turn. He and the Dark Rider were both annoyingly good at surviving the attacks of four Skinks each whilst not even being able to stand up!!!!!!! It was frustrating until I managed to corner his Dark Riders and Shades, however, I lost one too many Skinks and they bottled out - Darn, so close, so close. What did I learn? Skinks are great and the poisonous effects of their weapons are fantastic. If it had been a straight wound and out instead of down/pinned/out of action then I’d have won very quickly. Already at a loss leader with the low number of Lizards I had to Elves. Luckily, Chris put the majority of his army at one end of the battlefield and his two Reaper Bolt Throwers, Witch Elves and Shades the other. So I turned around and ran away from this end and headed straight for the squishy Elves rather than the big wooded death from afar and the poisonous nastiness of the skimpily dressed Siouxsie and the Banshee wannabe’s. 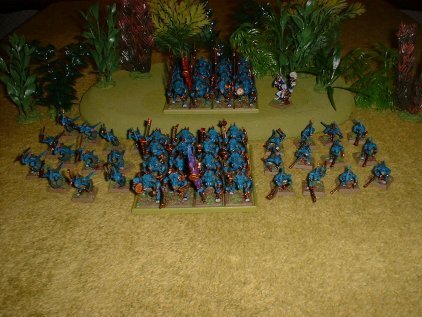 Instead I headed towards Crossbowmen, Warriors, Dark Riders, Cold One Knights and a War Hydra - cause that’s sane!!!!!!! In the event the Hydra decided to pick on my Skinks. They blow piped him twice, twice in my turn twice when he charged in. They shouldn’t have stood a chance, but poisonous darts made a mockery of his high toughness. 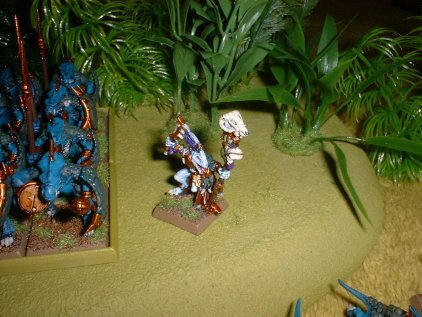 By the time he connected with the little Lizards he was down to one wound and had lost his Beastmasters. He slaughtered them in the ensuing combat but then ran off due to his monster reaction roll, 80pts odd of Skinks for over 200pts of rampaging nasty monster? Definitely worth it!!!!!! The last thing that happened was a combat between my second unit of Saurus and Chris’ Cold One Knights. The combat ebbed and flowed and I appeared to be on top. Then my Scar Veteran missed all of his attacks. The Cold One Knights beat me, I failed my leadership test and was slaughtered. All I had left was my Priest Hu’kas Pu’kas. He had been handy all throughout with his "Second Sign of Amul" and "Forked Lightning", but he wouldn’t win me the game. Another loss. "Nothing except a battle lost can be half as melancholy as a battle won." This site is © 2003-2007 Cambridge City Games Club and/or it's contributors.